The 27.7 metre sailing yacht Red Sula, listed for sale by Jeremy Peek at Nautor’s Swan Brokerage in Monaco and dahm international, has been sold. Natuor's Swan Brokerage represented the buyer and she has now been renamed Strathisla. Built in carbon fibre by Nautor’s Swan to a design by German Frers, she was delivered in 2009 as one of the fastest and most sophisticated Swan 90S models ever built. Accommodation is for up to nine guests in four cabins consisting of a master suite, VIP suite and two twins, all with entertainment centres and en-suite shower facilities. In addition, there are quarters for two crew aboard this yacht for sale. Red Sula has been equipped to the highest possible level of quality with a long list of options and state-of-the-art technology to ensure utmost sailing performance in safety and comfort. 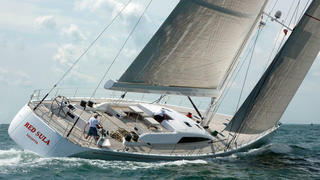 She features an advanced and fully hydraulically operated sailing and furling package, including an in-boom furling mainsail and further regatta equipment. With a deck in semi-raised saloon configuration, this remarkable Swan 90S is well set up for short-handed sailing and has a lifting keel that reduces her draft to only three metres to facilitate manoeuvring. Under power, a 285hp Volkswagen engine gives her a cruising speed of 11 knots. Virtually unused since new, Red Sula was asking €5.2 million with VAT paid.